If you’re running into issues with your AtoM installation, there are several maintenance actions and command-line tasks you might want to try using to see if they resolve the issue, prior to seeking external support. This page will outline some of the most common issues, and how to resolve them. What are the exact steps required to reproduce this issue? What is the error encountered? Being able to articulate these clearly will often help you figure out what solutions you should try first - and if you can’t resolve the issue, you’ll need this information to seek further support. It’s also useful to try to rule out any factors that are unrelated to the issue. For example: can you reproduce the error using a different browser? What about a different computer? If your AtoM site is publicly accessible, does it behave differently if accessed from home as opposed to work (i.e. might firewalls, VPNs, or other restrictions be affecting your access)? Is the issue particular to a specific user or group, or does it affect all users? If it’s an error related to a task supported by the job scheduler, is it just this one task that isn’t working, or are all jobs failling? And so forth. With a detailed step-by-step guide to reproducing the issue, we can now better diagnose the problem and consider what we can try to resolve it. Another thing you can try to collect more information on the nature of the error is to see if a stack trace is available. This is particularly useful if the error results in a blank screen. AtoM makes use of several PHP extensions, services, and libraries that are used to support the functionality of the application. These are not managed directly by AtoM or Symfony, and their use and location will depend on your particular installation environment. The following commands assume you have followed our recommended installation instructions - if you have made changes, some of the commands may be different in your installation. Restarting services can be a useful first step in trying to resolve issues - if the service is in a bad state as a result of an aerror that has occurred, then restarting it can often return it to a working condition. Below are basic instructions for restarting PHP-FPM, Memcached, Nginx, and the atom-worker. PHP-FPM is a PHP extension that allows for better interaction with an application’s web server, via the use and configuration of FastCGI pools in PHP. In AtoM’s default installation configuration, Nginx will proxy PHP requests to PHP-FPM. FastCGI is a binary protocol for interfacing interactive programs with a web server. FastCGI is a variation on the earlier Common Gateway Interface (CGI); FastCGI’s main aim is to reduce the overhead associated with interfacing the web server and CGI programs, allowing a server to handle more web page requests at once. Nginx (pronounced “engine x”) is an open source HTTP web server (among other things). It manages the interaction between your web browser and AtoM. Your browser requests a page in AtoM, and this is sent to Nginx, which communicates with AtoM to retrieve and serve the page, or else returns an error message. Memcached is an open-source, general purpose distributed memory object caching system. It is often used to speed up dynamic database-driven websites by caching data and objects in memory to reduce the number of times an external data source (such as a database) must be read. In some cases, your errors may be caused by a lack of resources - CPU, disk space, and/or memory - or because you’ve encountered the limits imposed by your PHP configuration. If this is the case, you might need to make changes to the PHP pool configuration or allocate more resources to your server. Before we make any changes, it can be useful to do some basic monitoring - is this a temporary spike, or an ongoing issue? Can you reproduce the issue while monitoring resource usage and see any correlation? To launch htop in your terminal simply enter htop. The console will display a text-mode graph of your CPU, memory, and swap usage at the top of the page, with a detailed list of processes provided below. This should give you a better sense of whether or not you have enough resources allocated to your AtoM server. It can also be useful to try to reproduce the error(s) you are encountering while monitoring. Why do I get a 504 Connection timed out error? A great deal of issues in AtoM can be resolved by running some of the most common command-line and maintenance tasks included in the application. Some brief details on each, and when you might want to use them, are included below. 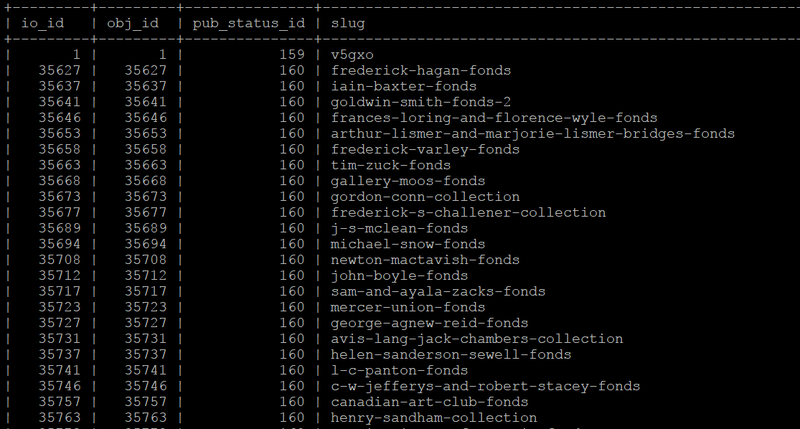 AtoM maintains an Elasticsearch search index to provide fast, full-text search results with faceting. It is this index that allows AtoM to find and display records in the user interface when browsing and searching. Running this task will delete the current index, then repopulate and optimize the index. Depending on the number of records in your installation, this can take a while to run - for production sites, we recommend running this task after regular business hours. Do you keep getting warnings in the console when running the search:populate command? If so, you may have to resolve some data corruption issues first. See below, Dealing with data corruption. The Symfony 1.x framework that AtoM is built upon includes the ability to cache HTML content, for better responsiveness to HTTP requests. One of the ways to speed up an application is to store chunks of generated HTML code, or even full pages, for future requests. This technique is known as caching, and it can be managed on the server side and on the client side. Occasionally, when errors occur or changes have been made, we need to flush the cached HTML so we are being served updated content, and not an outdated version of a web page. Running the cache:clear command will empty out the existing application cache so it will become repopulated overtime with updated versions of the web pages in AtoM as they are served to you. Because AtoM is session based, clearing the web browser cache might log you out of the application. Be sure you have saved any work you are doing in the user interface saved before doing so. There are also other caches to consider clearing! Finally, don’t forget that your web browser has its own cache - in some cases, if you are not seeing changes take affect, you might want to try clearing your web browser cache. Note that, because AtoM is session based, clearing the web browser cache might log you out of the application. Be sure you have saved any work you are doing in the user interface before doing so. AtoM generally uses a relational database to store its data (generally, MySQL). However, relational databases, which are comprised of flat tables, are not particularly suited to handling hierarchical data. As developer Mike Hillyer notes, “Hierarchical data has a parent-child relationship that is not naturally represented in a relational database table.” One method of addressing this is to employ a “Nested set model” (Wikipedia). AtoM makes use of a nested set to manage hierarchical relationships, such as between parent and child terms and descriptions. Sometimes, during operations that involve updates to large hierarchies, the nested set can become corrupted - especially if the server times out during an operation that reaches the execution limit settings. This task will rebuild all nested sets in AtoM. A slug is a word or sequence of words which make up the last part of a URL in AtoM. It is the part of the URL that uniquely identifies the resource and often is indicative of the name or title of the page (e.g. : in www.yourwebpage.com/about, the slug is about). The slug is meant to provide a unique, human-readable, permanent link to a resource. You can read more about slugs in AtoM here: Notes on slugs in AtoM. In some cases, AtoM may time out in the middle of an operation that involves the creation of new records. In such cases, it is possible that AtoM has died after creating an information object, but before having a chance to create a slug for the record. This can cause unexpected errors in the application - most notably, 500 errors when trying to access the records missing slugs through the application interface. This task will generate new slugs for any that are missing them in the database. Data corruption refers to errors in computer data that occur during writing, reading, storage, transmission, or processing, which introduce unintended changes to the original data. In AtoM, this often means missing or incorrect values written to the MySQL database when a transaction fails to complete. Depending on the nature of the corruption, this can sometimes exist in your data for a long time before causing any noticeable issues. Data corruption can happen in AtoM when large operations are aborted mid-process - for example, attempting a large move, publication status update, or import via the web-based user interface, and having it time out before the task completes. As of AtoM 2.3, database transaction support in MySQL was added to AtoM, which should reduce the likelihood of corruption - if an operation times out, then the database should automatically roll back to the last known good state. However, if you continue to experience errors in AtoM and have attempted many of the steps above without result, then it’s possible that you’ve encountered some corrupt data, and will need to perform some manual checks and fixes to address it. Data corruption can occur in any entity type in AtoM, but it seems to occur most frequently among information object data - AKA archival descriptions, likely due to the fact that there tends to be many more descriptions than other entity types in a typical AtoM installation, and information objects are one of the few entity types in AtoM organized hierarchically. It is beyond the scope of this documentation to cover all possible forms of data corruption. Instead, the sections below will provide solutions for the most common forms of information object data corruption, followed by further resources should you need to inspect and fix data corruption in other entity types. You can use SQL to check the status of your information objects and see if all necessary values are present. You will need to know the database username and password you used during installation, as well as the database name. If you don’t remember these, you can always check them by looking in one of AtoM’s configuration files - see: config/config.php. The following SQL query will output a 4-column table of information objects - the columns include the information object ID, the object ID, the publication status ID, and the slug for all descriptions. If any of the resulting rows are missing values, this will cause the search population task to throw warnings, and may cause other unexpected errors. If you see rows with missing slugs, you can use the slug generation task to resolve this. See above - Generating slugs. If you see rows with missing publication status ID values, then you can use SQL to replace these values for each missing instance. You will need to know the information object ID for the target row (listed in the first column of the table shown above). In the following example query, XXXXX represents where the object ID should be added. The third value, represented by YYY in the example below, will be the publication status ID value - use 159 to mark the target record as Draft, and 160 to mark the target record as Published. If you see rows with a missing object ID then congratulations, you have encountered a rarer form of data corruption! You have two options for addressing this issue. The first option is to simply delete the entire row in AtoM - this should cascade across other related tables. This solution will only work if the target row is not a parent record of other descriptions. This means you are completely deleting this description from AtoM, and will need to recreate it manually via import or via the user interface at a later date. We recommend that after deleting the affected row via SQL you rebuild the nested set to resolve any corruption in the hierarchy resulting from your changes. Again, we recommend that after making these changes you rebuild the nested set to resolve any corruption in the hierarchy resulting from your changes. Finally, there is one other data corruption edge case which can happen in rare circumstances: when an information object ends up with a duplicated publication status. As with the other examples above, we recommend that after making these changes you rebuild the nested set to resolve any corruption in the hierarchy resulting from your changes. As noted above, data corruption can potentially occur in any entity type in AtoM, but it is beyond the scope of this documentation to provide a solution to every possible issue. If you think you are encountering data corruption in another entity type in AtoM, you’ll need to do some research! We have collected some resources below to assist you. Finally, be sure to double-check the MySQL reference documentation for your version for further tips on constructing SQL queries. Below are a few extra SQL queries that might be useful when troubleshooting data corruption in other entity types. If none of the above suggestions have resolved your issues, it may be time to seek outside assistance. Remember, before seeking support, you should be able to clearly articulate the issue you are encountering, and provide detailed information on your installation environment. See above, Figure out the nature of the problem for suggestions. Before posting, we strongly encourage you to read the above page, especially the code of conduct and What should I include in a post sections. We also encourage you to search the forum and browse related threads for suggestions before posting. If you have reviewed our documentation, tried the suggestions in this troubleshooting page, and searched the forum for related issues and are still encountering errors, you can start a new thread in the user forum. Did you follow our recommended installation instructions? If yes, are you using Ubuntu 14.04 or 16.04? Including a useful and descriptive title for your thread will also help other users reference the thread in the future if they encounter similar issue. Below are some initial troubleshooting suggestions for frequently asked questions. Why do I get a blank white screen? Why do I get a 500 (Internal Server) error? Why do I get a “Max execution time” exceeded error? Why do I get a “Allowed memory size” exhausted error? Why do I get a “Too many connections” error? Why do I get a “MySQL has gone away” error? Why do I get a “Parent Resource id: ‘XXXXX’ does not exist” error? Why do I get warnings when populating the search index? Why do I get a SearchPhaseExecutionException when trying to search? Why am I seeing strange behavior in the AtoM treeview? Why can’t I upload (large) digital objects? Why can’t I log into AtoM? What should I do if I get an error that isn’t described here? If you get an error message, please see if it is addressed below. Then Elasticsearch has encountered errors in your data, and was unable to find the listed information object IDs - consequently, these records have not been added to the search index, and will not be discoverable in the user interface via search and browse. This indicates an issue with Elasticsearch. The status of shards must be green or yellow. If the status is any shard is red, you might want to try to restart Elasticsearch again. A 504 Gateway timeout error usually means that the server acting as a gateway to handle the HTTP request is either down or too slow to fulfill the request. This can occur for a number of reasons, and it could be temporary so the first thing you might want to try is simply repeating the request. If you’re seeing spikes, then you may need to increase the available system resources (such memory, CPUs, and/or disk space). If the job shows errors or refuses to complete, see the section above on Restarting the Job scheduler. Don’t forget to clear your web browser’s cache as well! If you’re trying to upload digital objects via the user interface there are a couple things you can start to check. First, AtoM’s multi-file uploader (used to Upload multiple digital objects at once) currently requires Flash to be installed and enabled in your web browser. If you can’t see any upload link, or you are constantly seeing an error in the widget when trying to upload an image, you may need to enable Flash. Second, there have been reported issues with some browsers and the multi-uploader. Try using a different web browser and see if the outcome is different. If the file never uploads, or the process times out while attempting the upload, then the file itself may be too large to import via the user interface. One important thing to note is that currently, the digital object uploads are performed synchronously - that is, on-demand, in real time, via the web browser. Because most web browsers have a built in timeout limit of about 1 minute (to prevent long-running requests from consuming all resources like memory and crashing your browser), your upload may fail if the digital object is too big. If the login button is not showing, it could be that it is simply hidden in your theme. You can try navigating directly to the login page by adding /user/login to your base URL. For example, if your AtoM site is normally available at www.my-archives.com, try navigating to www.my-archives.com/user/login. If you are simply redirected to the homepage instead of seeing a login screen, then there are a few possibilities. The first is that you have turned on AtoM’s “Require SSL for all administrator functionality” setting in Admin > Settings > Security, but you do not currently have your SSL certificate properly configured for your AtoM site, or are trying to login via HTTP instead of HTTPS. For more on this setting, see: Security panel. Similarly, it could be that you (or someone else) has configured IP whitelist restrictions via the Security panel - ensure you are logging in from a white-listed IP. If you have accidentally turned on the “Require SSL” setting and can’t log in, it’s possible to use SQL to disable this setting. For basic information on accesssing MySQL via the command-line, see: Common AtoM database queries. You will need to know the user and password you used for the database when installing AtoM, as well as the database name. Can’t remember what values you used during installation? You can always find them listed in the config/config.php AtoM config file. See: Manage AtoM configuration files. The other reason you migh be getting booted back to the home page whenever you try to login is that it’s possible login for this installation is disabled via a setting in one of AtoM’s configuration files - specifically, the config/app.yml file. Before you update this, double-check: is your installation using a 2-site deployment model (e.g. one internal read/write site, and a second public facing read-only catalog)? If yes, are you sure you are trying to log into the internal site, and not the public read-only site? There is also an environment variable maintained in /etc/php5/fpm/pool.d/atom.conf that can override the one in config/app.yml. We recommend checking both files. In the atom.conf file, ensure that env[ATOM_READ_ONLY] is set to “off” to disable this setting and allow users to log in again.